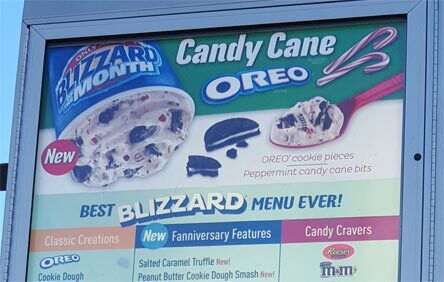 [New for Nov 2015] Ok, the candy cane chill blizzard finally has a sibling, and to keep things simple, I'll start this by saying it's a worthy upgrade. Not seeing a ton of candy cane bits, but there is a light pink hue to everything. While I wasn't necessarily wowwed on the first bite, this one grew on me immensely. 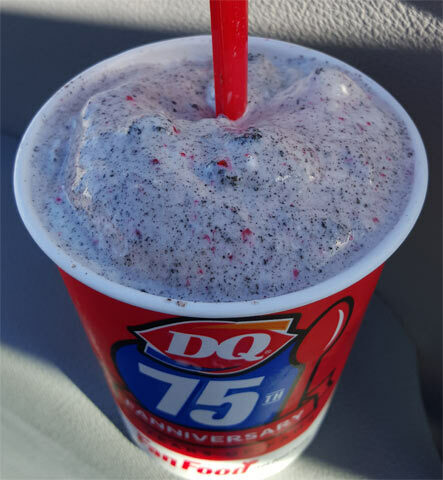 As you continue along, you can't help but think that some kind of funky blizzard magic is happening because I swear I taste peppermint Oreo cream and that my friends is a very positive thing. Everything just really balanced itself out. It wasn't super minty, but there was that distinctly candy cane effervescence to it. You do get a little bit of crunch from the candy cane as well but nothing crazy. These points may vary from location to location, server to server, but whoever made mine, despite not being the most beautiful thing at first, wound up really hitting the spot. Ok, that's it. It's a fine blizzard and I regretted only getting a small. This one is available through December and I definitely foresee picking it up a few more times to see if I get any more candy cane or cookie chunks in the next one. I think this is going to be my holiday favorite! Love. Love. Love. Mine wasn't mixed great and the top was all Oreo with a little mint and at the bottom it was all of the mint pieces, so many that the Ice cream was Red. Still great though, I would definitely get it again.